I know you're excited to cut out some cool snowflake patterns, but before you begin, you'll need to know how to make paper snowflakes. If you don't, go ahead and click on that link and come back with your folded triangle like the one in the image below. Fold a square piece of paper in half to make a triangle. Fold the triangle in half again, then into thirds. Cut around the edges of your folded paper any way you like, then open up the folds to reveal your snowflake. Print out my snowflake PDF templates on paper and fold according to the instructions on the printed paper. 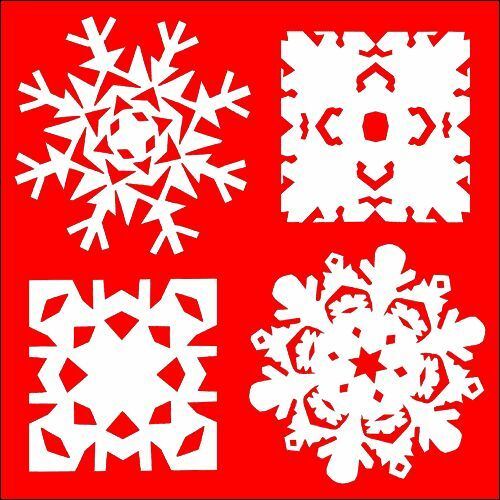 Using SHARP strong scissors, cut the snowflake on the lines indicated on your template. When done, unfold your snowflake and enjoy its beauty! In her snowflake cutting how-to, Ashley reveals the secret to making an elaborate six-pointed snowflake: It's all in the fold. Start with a square piece of paper, follow her step-by-step folding instructions, then let your scissors do the rest.